When Freekehlicious approached me about a professional collaboration featuring this ancient grain, Freekeh, I said yes without a shred of hesitation. What better way to celebrate this ancient grain with fall/winter seasonal ingredients on this momentous occasion, Thanksgivukkah ! This hybrid of Chanukah and Thanksgiving holiday comes around only once in a lifetime. This year the first day of Chanukah falls on Thursday, November 28, 2013, Thanksgiving. Next time these two holidays will collide will be in 77,798 years. Freekeh is a parched or roasted young green wheat that is then peeled. It has a wheat berry like consistency with a nuttiness and a subtle smokiness in flavor. Originated in the Levant, Freekeh is very popular in Middle Eastern and North African cuisines. Bon Appetit magazine named it 'Top 8 Pantry Staples for Healthier Eating' back in 2011. Freekeh is a low carb, high in fiber food with a low glycaemic index and high in protein. It has digestive, diabetic and immune health benefits. You can read further about Freekeh's health benefits here. Freekehlicious is 100% natural with no pesticides, additive or preservatives. I was really impressed by its quality. How clean the grain is from small pebbles and any debris. No pre-sifting needed with Freekehlicious. Once in a while I will use Freekeh to make Hamin, otherwise known as Cholent, but never got around to posting it. Hamin is cooked on low heat overnight for Shabbat dinner. One of these days I will post my Hamin recipe but meanwhile I will share this side dish/salad I always bring over, when invited by friends, around the holidays. The beauty of it is that a little lemon, honey and parsley go a long way. Once in a while I will add fresh dill and mint to it as well. You can switch around the ingredients based on your whim, what you have at home and the season. It will always look beautiful and be super delicious and nutritious. My friend's son always requests it. 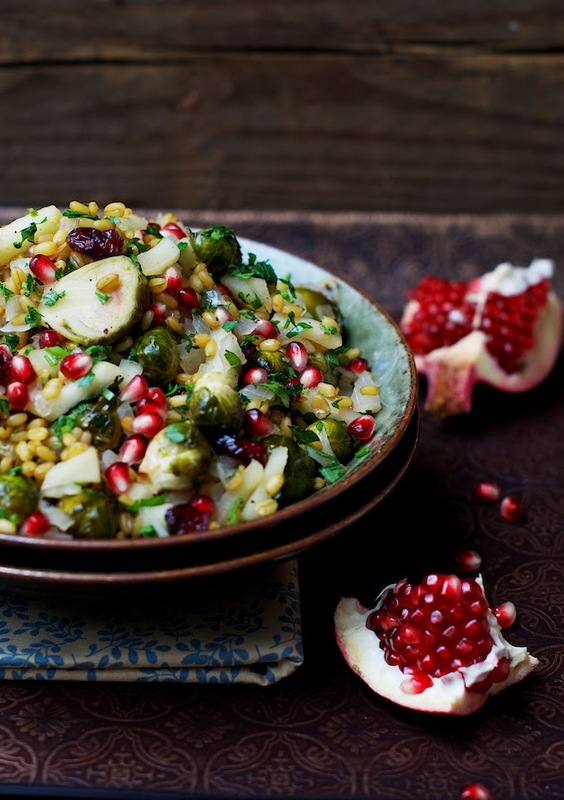 The freekeh can be served elegantly in this fashion too along with the turkey. Freekelicious is available at Harris Teeter stores nationwide or order online here. You can connect with Freekehlicious on Twitter and Facebook for more Freekeh recipes conversation. On stove top in a small saucepan, place 1/2 cup of Freekehlicious and 1 1/2 cups of water or broth and bring to a boil. Stir, reduce heat to simmer. Cover and cook. Remove from heat and let stand for 5 minutes. Drain any remaining water. Yields 1 1/2 cups. This step can be made a few days ahead and the Freekeh can be kept refrigerated in an air tight container. Pre-heat the oven to 400F. Toss 2 tablespoons of oil and 1/8 teaspoon salt with the Brussels sprouts, spread on a parchment papered cookie sheet and roast for 20 minutes while turning once with a spatula at the 15 minute mark. If you wish the Brussels sprouts to be more charred, roast for 5-10 minutes longer with another turning in between. Set aside, or this step can be made a day ahead and the oven roasted Brussels sprouts can be kept refrigerated in an air tight container overnight. The day of: On low/medium heat add 2 tablespoons oil into a large sauté pan. Add the onions and sauté for a few minutes until the onions are soft and translucent. Do not caramelize onions. Add the diced apple and lemon juice to the onions and continue sautéing for a few minutes longer until the apples are soft but not mushy. Add the honey, 1/8 teaspoon of salt and some freshly ground black pepper and continue sautéing for a couple of minutes longer. 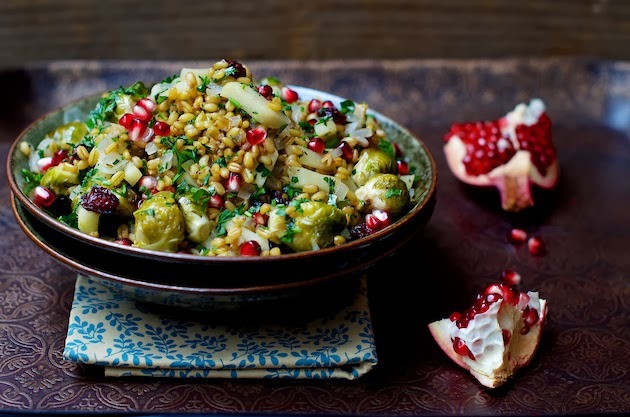 If the Freekeh and Brussels Sprouts were made ahead and refrigerated, add them to the pan to reheat with the onions and apples for a few minutes. They only need to be warm, not super hot. Take off the heat and add the dried cranberries, pomegranate seeds and parsley. Mix and adjust for salt and black pepper and serve warm or at room temperature. Cook's note: I showed you make ahead prep steps, but you can make the entire salad a couple days ahead and keep refrigerated in an air tight container. Re-heat in a pan for a few minutes on low/medium heat before serving. Garnish with some more fresh parsley leaves the day of. The dish can be good up to five days refrigerated. Recipe on Freekehlicious site here. I have a bag of freekeh in the cabinet and I've been trying to decide what to do with it. Now I know! This looks amazing!! TY Megan. Let me know how it turned out. Happy Thanksgivukkah. A plendid way of preparing Brussel sprouts! So colorful, flavorful and appetizing. TY Jael. It's so versatile, isn't it?! Outstanding! You make everything so gorgeous! I still have some freekeh. Can't wait to try it on this! I keep forgetting to use the freekah in my cabinet, which is a shame because it's a very tasty and healthy grain. This may well end up on my Thanksgivukkah table. Your images are gorgeous. Thanks for sharing this! TY Jennie. Let me know when you make it. Wow Shulie! So gorgeous and makes me want to go and get Freekah right now. I haven't had the chance to try freekeh but your salad is gorgeous, love the colors! Beautiful salad, Shulie. 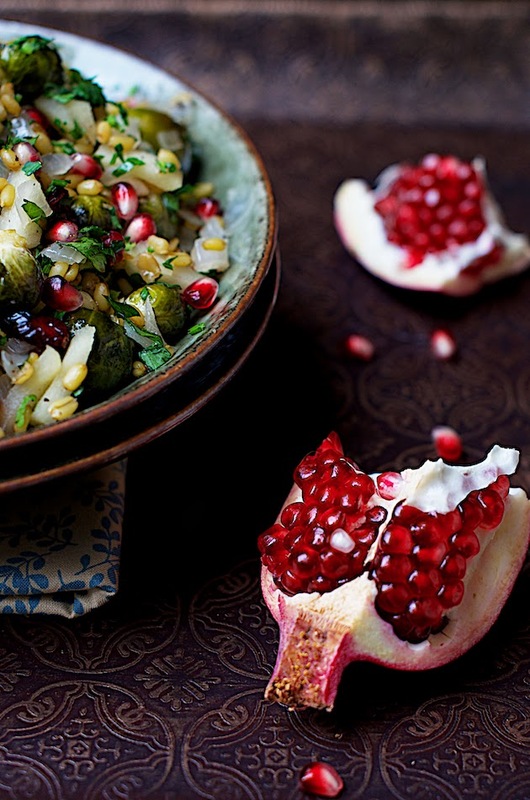 The pomegranate seeds simply pop off the plate! yum I love freekeh and your dish is so colorful. This would be beautiful on the Thanksgiving table for sure! Nope, I don't mind. TY, Alex! This dish looks wonderful and colorful and tasty and I got so excited about it that I decided to serve it to some friends I'm cooking dinner for. Only then did I realize that I can't for the life of me figure out how many people this recipe serves. Hi Jelena, It depends. If you serve this dish as a side, among many other side dishes, it can be enough for a crowd. I bring it to large parties. If you are planning on generous serving of this than I would say serves 8?! What can be substituted for promegranate? You can leave it out. Substitute with currants or other dried fruit or fresh berries.